The Nobel Prize in Literature, that stuffy, hermetic institution, has managed to draw more mainstream interest, and controversy, than is usual for a literary prize. Part of this has to do with the fact that the dozen or so members of the Swedish Academy, the awarding body, has decided to “finally” nominate an American, a full 21 years after Toni Morrison, and only a few years after the Academy’s permanent secretary claimed that “Americans do not contribute to world literature or translation”, and thus would not be rewarded collectively or individually for the rest of our lifetimes. The winner of this year’s prize is a little-known poet from Minnesota named Robert Zimmerman. However noble the attempt, it looks like another huge miss for the cloistered Scandinavian curators of international belles-lettres. Joking aside, the reaction to the win by Bob Dylan seem to run the gamut, from unbridled passion to undisguised disgust. Those of the latter camp are either offended that the American in question was not named Philip Roth, Don DeLillo, or Thomas Pynchon, or that the Academy had stooped to honoring a mere musician, a writer of popular songs, rather than a novelist. Criticisms of the Nobel Committee have long been easy to generate, due to the loose wording of the original mandate by Alfred Nobel, the secrecy of the process, and the relative obscurity of many of the winners. For my part, I am as guilty as anyone else of unloading on the Prize every few years when the winner is someone from a non-English-speaking or Western European country who is almost wholly unknown to the world. My very first blog post was a modestly self-righteous little screed to that nature, which also included some of the long list of worthy authors never given the Nobel (Tolstoy!, Joyce!, Borges!, Nabokov!…. ), and in which I actually name-dropped Bob Dylan as worthy of the award. I have softened somewhat in my stance, partly due to wider reading, partly due to the realization that such a Prize is merely the subjective and arbitrary opinion of a small number of Swedes, and not an annual nomination of the greatest living author dictated by Zeus from Olympus. In fact, the Academy has an impossible job, and they seem to go about it in two ways: popular, well-known authors from English-speaking or Western European countries are occasionally given their due based on their life work (say, T.S. Eliot, or Saul Bellow); or, virtually “unknown” authors from Scandinavia or other parts of the world are awarded for their various contributions to literary tradition. For every Hemingway and Faulkner (category 1), there is a Mo Yan or Herta Müller (category 2). I have increasingly come to appreciate the “unknown” winners as much as the popular ones, even if I have not read any of them and, and most cases, never will. It is in many ways a courageous stance to take, and also a more universal one. The Nobel is the oldest and most prestigious international prize, and to only award people from a certain cultural or geographical background would be parochial, small-minded. Besides, it is a private award with its own internal logic and criteria and money, and they can do with it what they like. He’s got the look of a poet, and he knows it. On that note, I would like to cast my lot with the applauders of the laureling of Bob Dylan. As far as I can tell, only 10 of the 113 winners of the Prize have been primarily poets. Dylan would be the 11th if we consider his lyrics as strictly poetry (though that would limit his underrated musical prowess). The most dominant literary form of the modern age is the novel, and the majority of the winners have been mostly or partly novelists. Dramatists make up a minority of the other winners (from George Bernard Shaw to Harold Pinter, including the strange choice of the Italian satirist Dario Fo), and there are also plenty of primarily non-fiction writers like historians (Mommsen and even (! )Winston Churchill) or philosophers (Henri Bergson and Bertrand Russell; Sartre nobly declined his). Often the Prize is given for lifetime achievement, and only rarely is any specific work cited as a major reason for the award (Hemingway for Old Man and the Sea; Thomas Mann for Buddenbrooks). Following the dominant trend, Bob Dylan was cited for his unique poetic expressions “within the great American song tradition”, and not for any single work (therefore, it isn’t like one of those occasional Rolling Stone Magazine lists that names “Like a Rolling Stone the best rock song ever). Nevertheless, the chairperson of the Committee did issue a follow-up comment, and a possibly preemptive defense against detractors, saying the album Blonde on Blonde would be a good starting place to his work. This is strange in a way, since anyone at all familiar with Bob Dylan would necessarily be familiar with this album. Against the resentful critics who are most likely issuing condemnations and diatribes against this award, I maintain that it is a brilliant and worthy move by the Swedish Academy. If literature is to be an artistic pursuit that prizes universality and creativity, why exclude songwriting? Poetry and music and the oldest of the literary arts. Oral communal performances of this art were one of the things that made humans into the civilized and social beings we are. Homer is the first personage to emerge from prehistory as the quintessential and foundational Western poet. I am happy that the Academy thus cited Homer and Sappho as part of the tradition that Bob Dylan has continued. Drama came much later than oral poetry and music and was perfected by the Greek trio of Aeschylus, Sophocles, and Euripides; at the same time, History was invented (Herodotus and Thucydides) and Philosophy became systematic (Plato and Aristotle). The novel, despite being the dominant literary form for the past century or two, is still the newest and, in many ways, the most individual and anti-social of the literary arts. I don’t mean anti-social in the normal pejorative sense, but just that it is a solitary and silent pursuit, from the point of view of both the writer and reader (and as Hemingway explained in his Nobel acceptance speech). Against the high-minded guardians of high culture and canonicity that populate our universities (apologies to Harold Bloom), songwriting, at its best, has the potential to combine the best aspects of our oldest traditions of poetry and music. 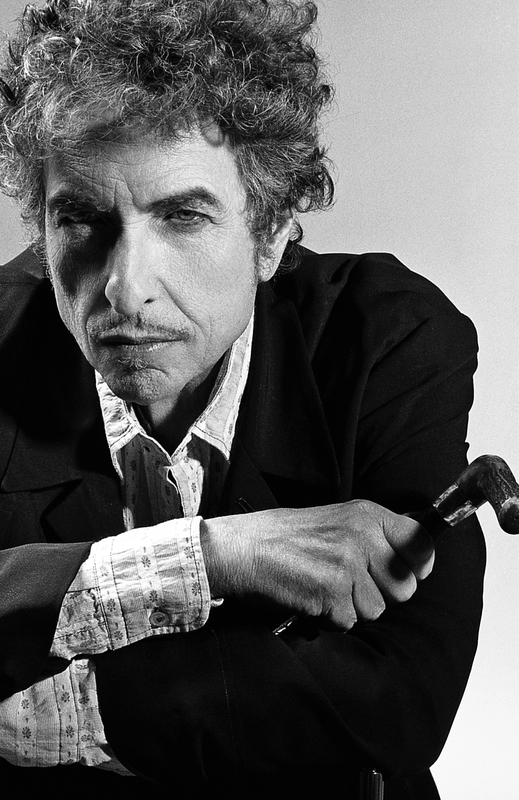 If we were previously forced to immediately think of the musician or songwriter most likely or most deserving of a literary prize like the Nobel, the first person we would all think of would be Bob Dylan (Leonard Cohen would possibly be the second, slightly less qualified, one). Let me not exaggerate and compare Bob Dylan to Shakespeare or Walt Whitman, but if there were any musician whose universality, popularity, and creativity began to approach those lofty heights, it would be Bob Dylan. I would venture an unqualified guess that the work of Bob Dylan has been more universally influential, well-known, and appreciated than almost all of the recent Nobel laureates, and will also endure for as long as the best of them. On that note, I applaud the Nobel Committee who has given us a champion for the people, for artists, for humanity itself. 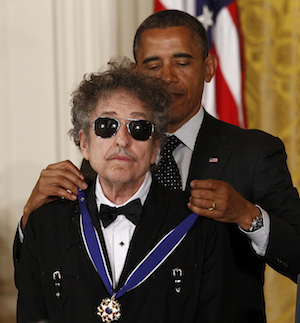 Bob Dylan, a true artist, is unimpressed by presidents and prizes. Bob Dylan, a lifelong, inveterate anti-authoritarian is probably more bemused than anyone by his latest award. He has famously outmaneuvered everyone who ever thought they had a handle on him, constantly evolving, absorbing new styles and influences, and putting out a steady stream of utterly unique and unforgettable pieces of his own lyrical art. Bob Dylan’s is one of those rare artistic minds, like Picasso’s, that was not limited to a single category of mastery, and could not help but to constantly express new outpourings of artistic experimentation and boundary-shifting work. To those purists who are trying to defend the secret and arbitrary criteria that serve as the gateway to artistic greatness, Bob Dylan has outsmarted you, too, and certainly doesn’t even care what you or anyone else thinks and never has. He has been touring non-stop for 25 years, putting out new critically acclaimed albums, incorporating new styles, and still inspiring and influencing everyone around him (including, I daresay, untold numbers of fellow laureates in all fields). He is an artistic center of gravity and creative genius of power, fecundity, and timelessness in the way most writers not named Tolstoy or Joyce and most artists not named Picasso or Matisse could only dream of. Like Whitman, Bob Dylan contains multitudes. If the bestowal of this arbitrary prize brings him more attention from younger listeners who were not previously familiar with his work, that can only be considered a win for everybody. Listening to Bob Dylan makes us better people, and makes us remember that we are part of a complex but beautiful thing called life. I don’t think Dylan wrote “Baby, Let Me Follow You Down.” I believe it is a traditional folk song.